Matthew Cramer, president of Dee Cramer Inc. of Holly, Mich., received the SMACNA Contractor of the Year award at the Sheet Metal and Air Conditioning Contractors' National Association's (SMACNA) 68th annual convention. The award is presented annually in memory of SNIPS magazine founder Ed Carter and his son Nick Carter, magazine publisher and editor. "Matthew has been an outstanding leader in assisting SMACNA's introduction of the concept of Building Information Modeling (BIM) to the SMACNA membership," 2011 SMACNA President Jim Boone said. BIM is an industry-changing technology that is transforming the construction industry, not only in increasing efficiencies when project complexity is increasing and project schedules are being constricted, but also in increased labor productivity and job profitability. "Matt has unselfishly shared his company's experiences and expertise in BIM to assist the membership in increasing its competitive advantage in the construction industry," Boone explained. "He personally took time away from his business and conducted a SMACNA webinar and convention session, plus he developed a chapter education program on BIM-all of which have been met with exceptional reviews by the membership." Cramer plays a leadership role in SMACNA's efforts to develop a MEP Contractors' Guide to the Spatial Coordination Process. This SMACNA/MCAA/NECA collaborative project will provide the MEP (mechanical, electrical, and plumbing) industry with well-defined guidelines and best practices for spatial coordination in the evolving BIM environment. He also serves as a member of the National Building Information Modeling Standard (NBIMS) Planning and Project Committees in the development of the second edition of the National BIM Standard, planned for publication by year-end. Cramer has served as chair of SMACNA's Products and Programs Coordinating Committee, Business and Financial Management Task Force, and Business Management University and Graduate Programs II Task Force. He has been a member of the Director Nominating Committee, the Business and Financial Management Committee, and the Business Management Graduate Program Committee. He also has been on the Computer and Financial Survey Task Force and the Computer Software Task Force. Cramer is SMACNA's representative to the BuildingSMART Alliance and serves on their Board of Direction. 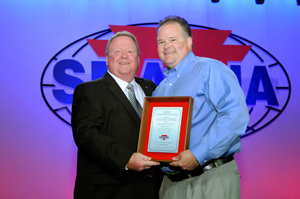 Cramer is the third generation to receive SMACNA's Contractor of the Year Award. His father, Richard J. Cramer Sr., won the award in 1997, as did his grandfather, Dee Cramer, in 1983. Cramer, along with his brother Rich, is the third-generation to run his family's sheet metal business, which has offices in Saginaw, Lansing, Wixom, and Holly, Mich. He started as a shop helper, rising to serve as its controller, CFO, vice president of sales/estimating, and president. He received his bachelor's degree in accounting from the University of Notre Dame. SMACNA, an international trade association representing 4,500 contributing contractor firms, is dedicated to promoting quality and excellence in the sheet metal and air conditioning industry. SMACNA has national offices in Chantilly, Va., outside of Washington, D.C., as well as on Capitol Hill.